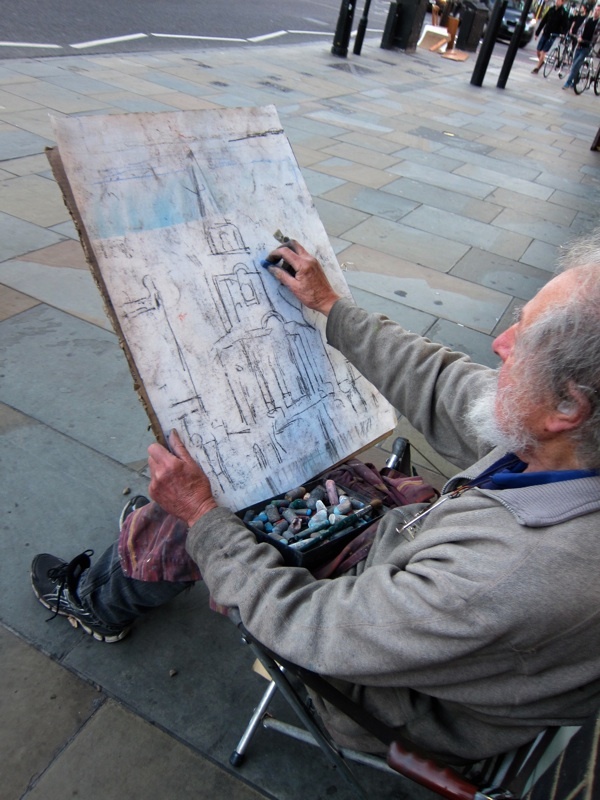 Anthony Eyton’s new exhibition DRAWING ON HAWKSMOOR opens at Eleven Spitalfields next week, providing the ideal excuse for me to tag along with him yesterday on an afternoon’s drawing trip – as he set his sights upon capturing the epic architecture of Christ Church in pastel upon paper. 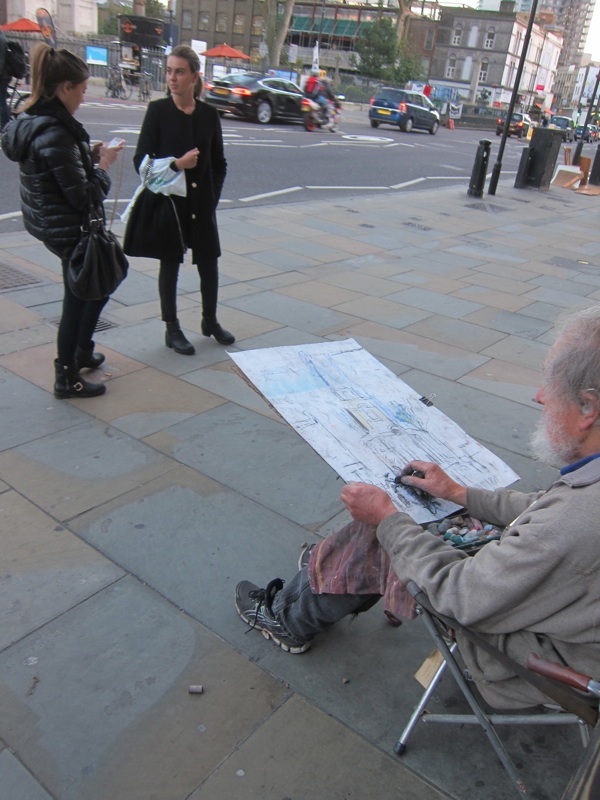 Those of you who visited Spitalfields Market at the weekend may have seen him there, sitting quietly drawing by the market gates, in the midst of the crowds setting out across Commercial St. 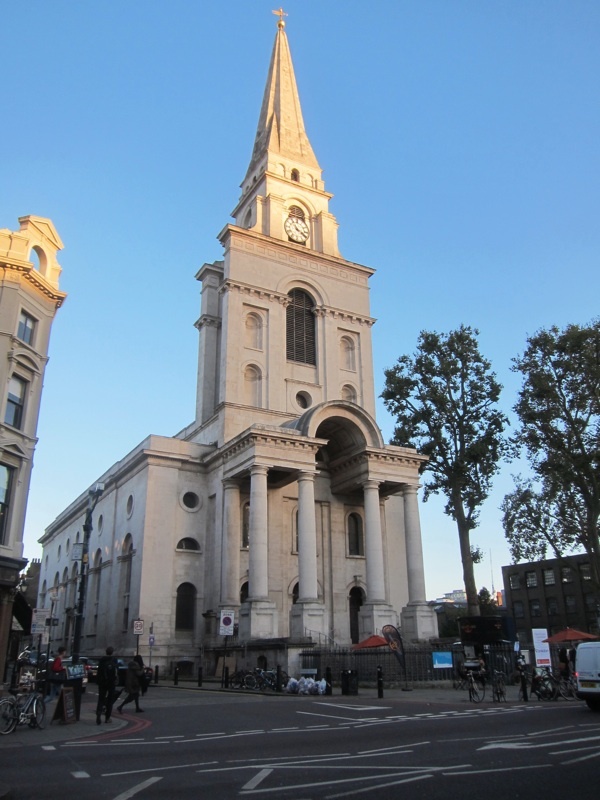 This was our appointed meeting spot and it was from here that I spied Anthony as he emerged from Fournier St, laden with his folding stool and drawing board. A tall grey figure with a white beard walking more slowly than anyone else, he almost appeared to glide along like a spirit from another world. I caught up with him at the coffee stall where downed a shot of expresso that noticeably accelerated his pace across to the market. 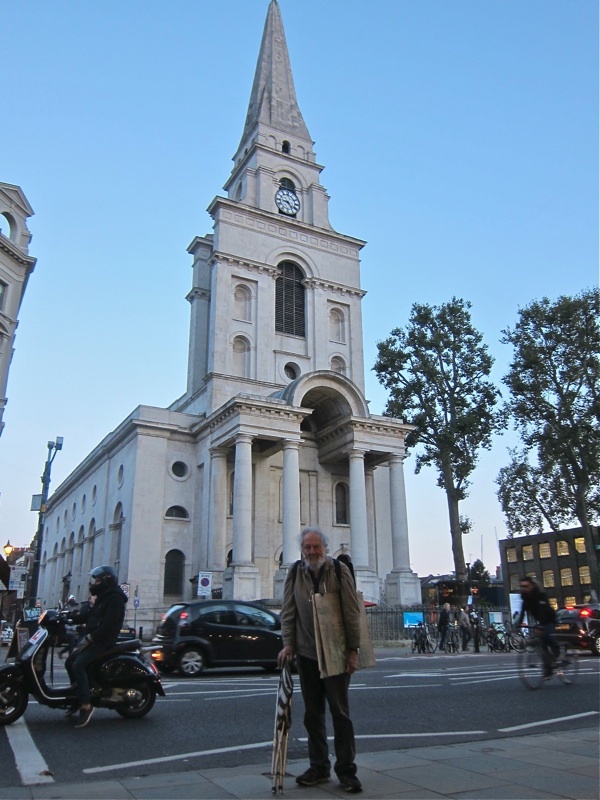 Now into his ninth decade, Anthony first came to Spitalfields in 1949, exploring after visiting the Mark Gertler memorial exhibition at the Whitechapel Gallery and, since then, he returned regularly over the years, keeping a studio in Hanbury St from 1968 to 1982. 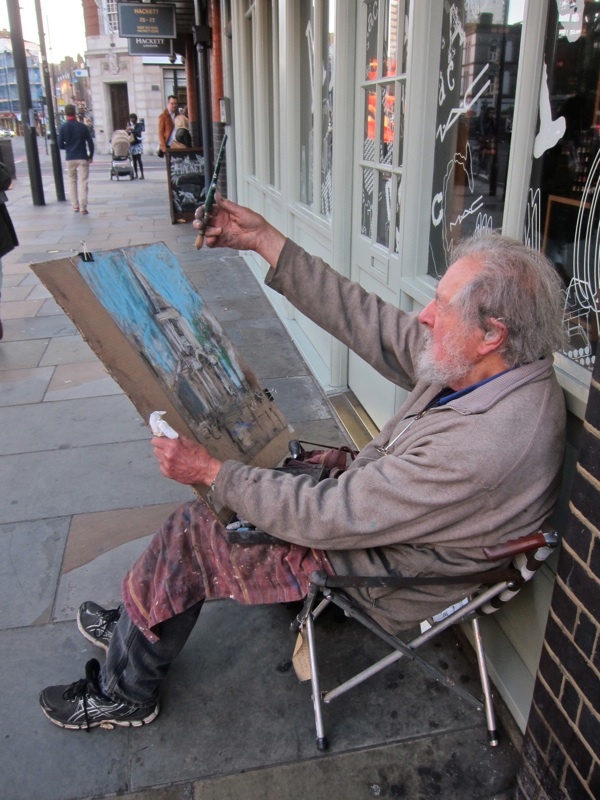 Anthony has spent a lifetime painting and drawing London and still sets out fearlessly on the bus from his home in Brixton to work on the streets of the city that is his creative domain. 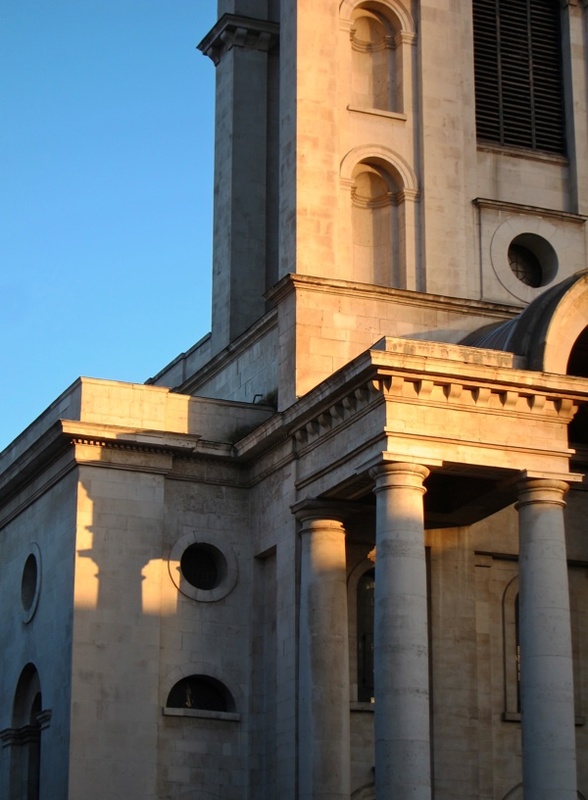 Anthony relieved me of this responsibility, by drawing my attention back when he declared, “Look at that!”, pointing out a reflected beam of sunlight from the south-west that passed through the portico of the church to create a dramatic shadow of a capital upon the wall to the north. “We’ll probably never see it again,” he announced with a philosophical grin, relishing this new fleeting revelation that had been granted to him in a location he had known for more than sixty years. 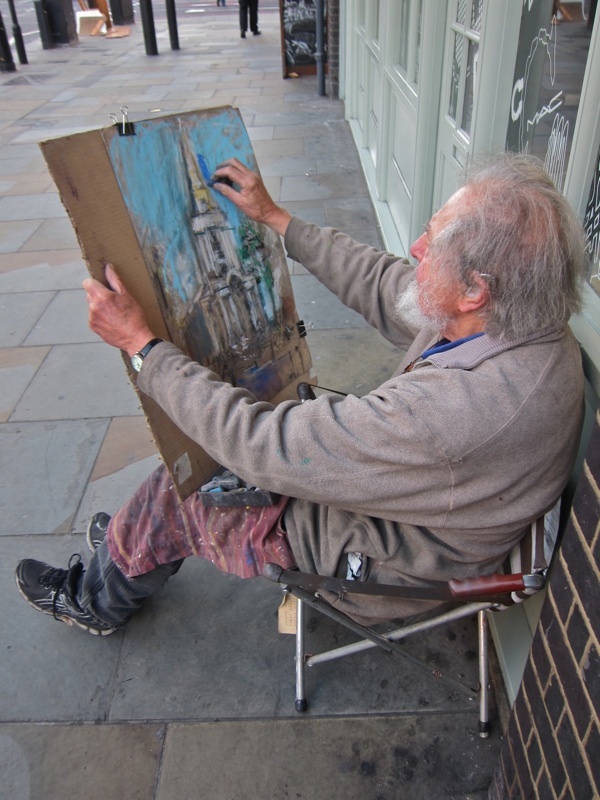 Now the sunlight returned, colouring the church with a last golden light and I fell to watching Anthony as he drew. He looked up to the church and made an observation – such as the glow on the eastern horizon, even as the sun was setting in the west – then recording this with a light touch. Anthony’s developing web of spidery lines conjured a shimmering vision of the monolith before us and being party to his method led me to look more closely at what was before us. “It’s not sitting on anything,” he assured me in dissatisfaction, looking between his drawing and the church, “it’s restless, not firm.” This realisation was the cue for Anthony to lay the paper aside and bring out a tracing of an earlier drawing which outlined just the structure in shadowy lines. “I’m going to have a look at this and se if I can do anything to it,” he said to himself, speaking his thought out loud. He applied pale blue pastel to the sky and smeared it vigorously with a dirty tissue, taking delight in the action. At once, the spire which had appeared inert before seemed to push up into the sky, like the prow of a ship piercing the sea. “There’s not many people around,” Anthony commented, gazing vaguely up and down Commercial St, “I prefer it on Saturdays and Sundays when it’s crowded.” He began drawing figures into the foreground, including two women in black who stopped to have a conversation on the pavement, and then – to my surprise – he began to add the traffic as we moved towards rush hour. 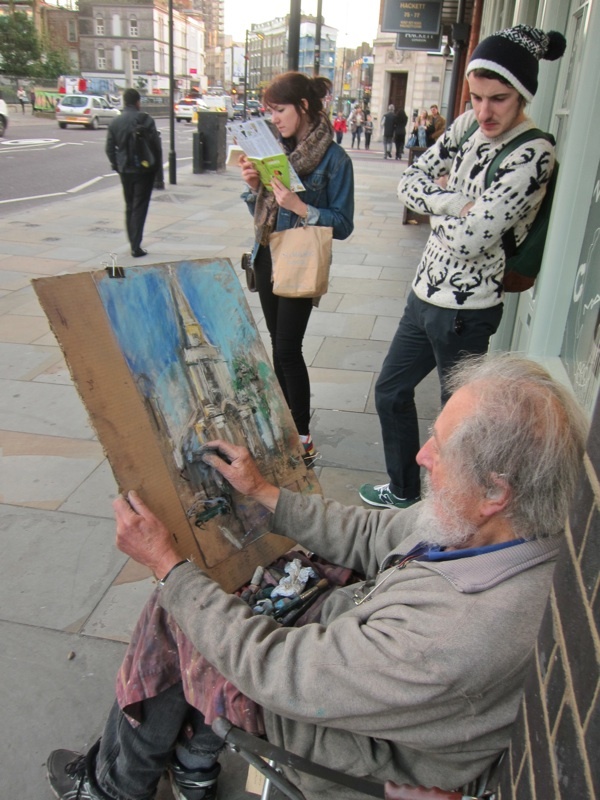 Anthony Eyton’s exhibition DRAWING ON HAWKSMOOR runs at Eleven Spitalfields from 7th November – 23rd December. Viewing by appointment 020 7247 1816.
beautiful, thank you. 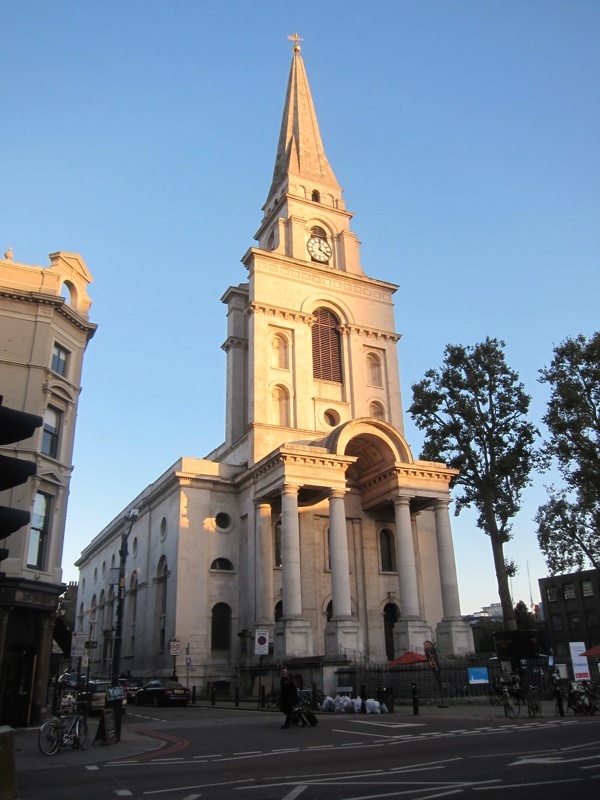 i don’t think i’ve seen a photograph or a painting of the church which i like better or which gives a better sense of its slimness and wholeness and elegance and separation from its streetscape. and how interesting to hear the artist articulate his problem and to see what he does to solve it, with both his drawing and the church itself before us. thanks again. 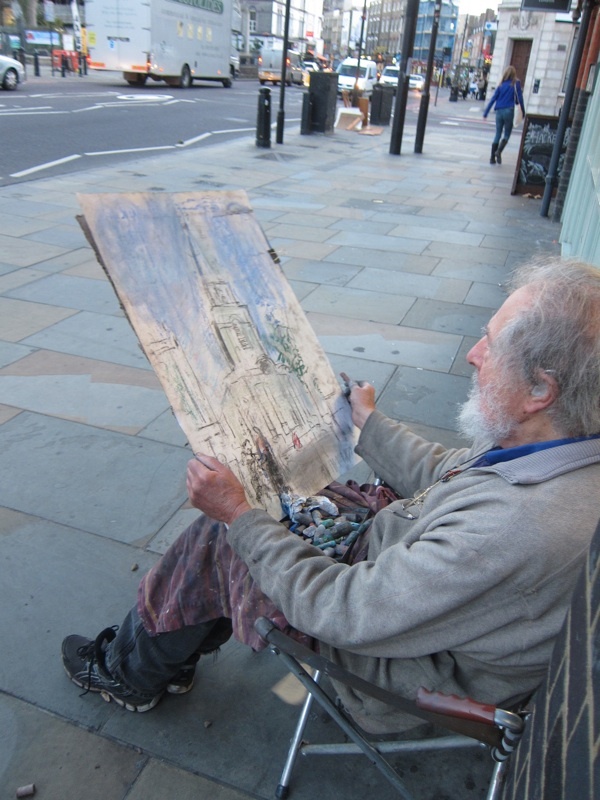 A fine report about Anthony Eyton’s work in progress. I can see he is a brilliant urban artist! All the best for the exhibition! Delighted to see that he is still here and still working. 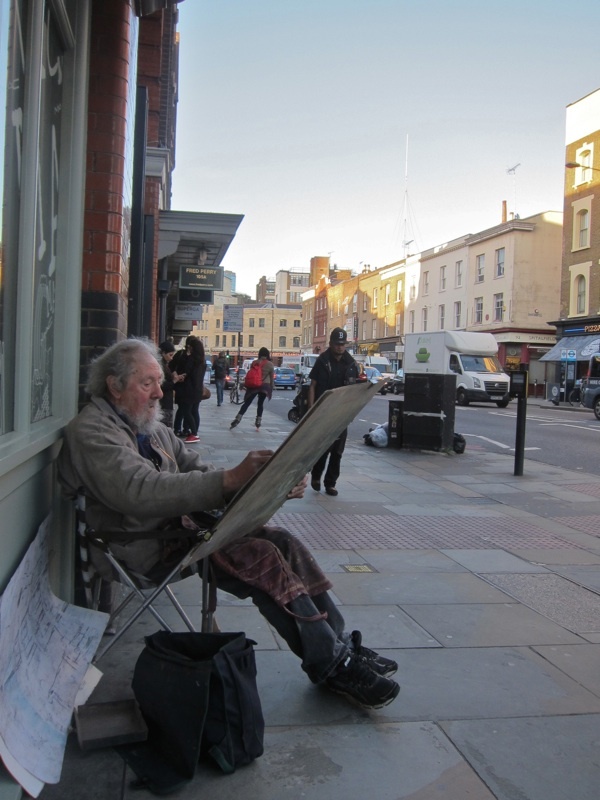 He was on the staff at Camberwell School of Art when I was a student in the late 50s. Wonderful. His rather beautiful hands bely their ninth decade. I rather agree with him about the attraction of a grubby building! Looking forward to the exhibition. It’s a lovely church and I think the sign on the side “Commit no Nuisance” is hilarious. I love the juxtaposition of your photos of the church with those of Anthony and his work in progress, both of you capturing the building and the particular day. A real pleasure to look at and also to read.